The Hickison summit area features an example of the 'Central Great Basin Curvilinear style' rock art. Nearby locations harbor hunting and living sites dating to 10,000 BC. In addition, historic sites include trails used by frontier explorers John C Fremont, Captain James Simpson, the Pony Express, and the Overland Stage Route. 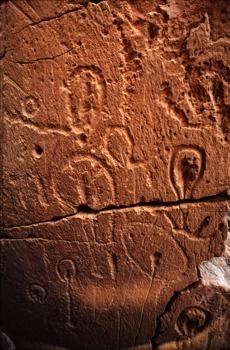 Unkown natives may have made these images about 1,000 years ago. And then again maybe they didn't.